Frills Fluff and Trucks: New Windows ~ Grid or No Grid? With the exception of our recently completed addition, our windows are original to our house and are 15+ years old. We have multiple breached and leaking panes and some of them are so leaky that we have moss growing inside in the tracks of our windows. Gross and not exactly energy efficient. 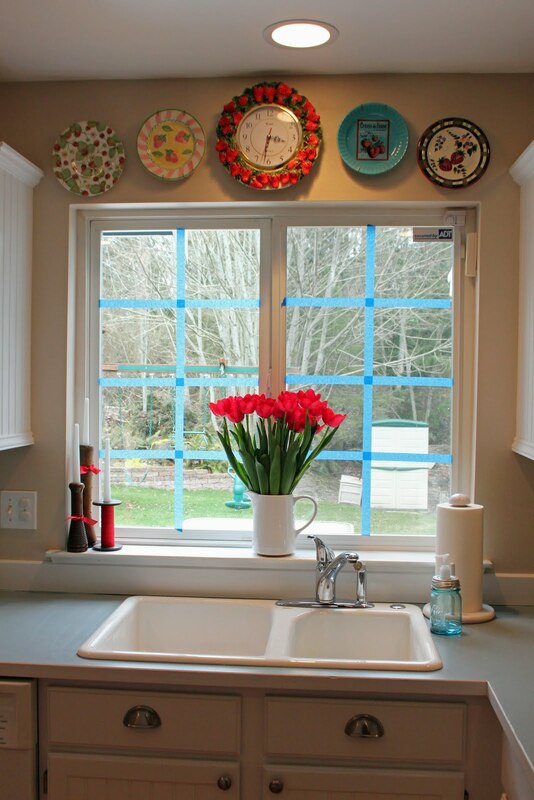 This spring we intend to get new windows in our house (we're waiting on a bid from our contractor) and I'm currently trying to decide whether or not my kitchen window should stay plain, as it is now, or have a grid in it to match the rest of the house. Most of our windows have a square grid pattern, but for some reason the builder opted to leave it off of a few windows. 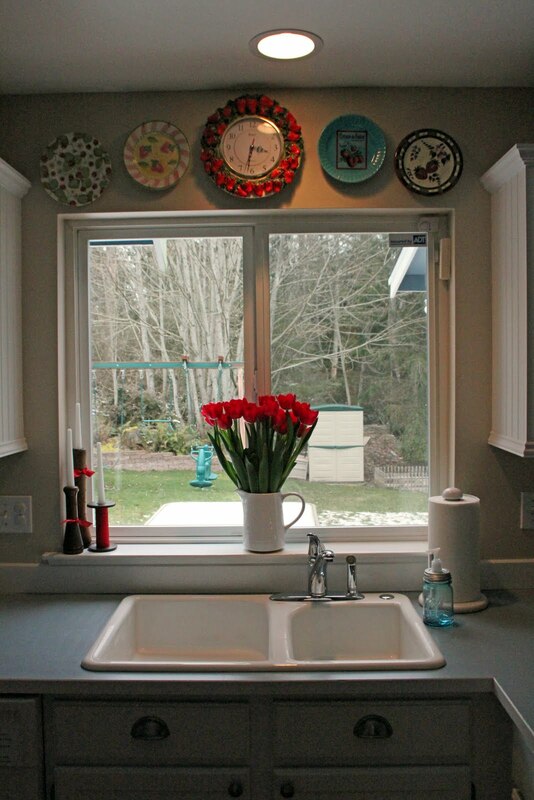 It was an easy decision for us to add it to those windows when we replace them, but I'm having a tough time with my kitchen window--I've become rather attached to the open view of the backyard and the greenbelt. 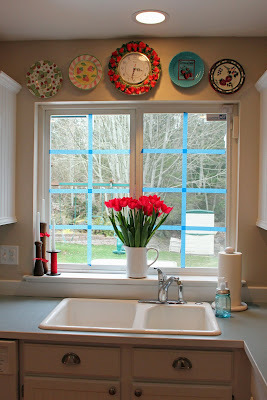 We put up some blue painters tape to simulate the look of the grids we have on our other windows. Now I feel like I have a very patriotic view...and I'm still completely undecided on what I want to do with the window. No grid. Hopefully when we settle down we can have a house with a completely open view. Grid. For sure. It will not be blue, so it won't be quite so obstructive. It just adds to your kitchen, I think. Grid. It is prettier and you wont even really notice once it is in. 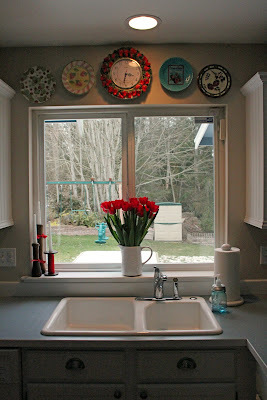 I would LOVE a kitchen window to look out of like this while doing the dishes! Funny thing is, I didn't even notice the tape until you put it in your post, I had to go back and look! 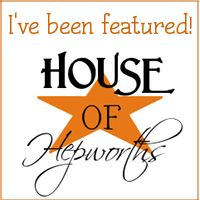 I'm leaning toward no grid, but I know whatever you decide will be wonderful!